Did you know that swimming is one of the best aerobic exercises? Or that it can slow down your ageing process? Yes, there are many benefits of swimming, besides it being a fun activity for the summers. 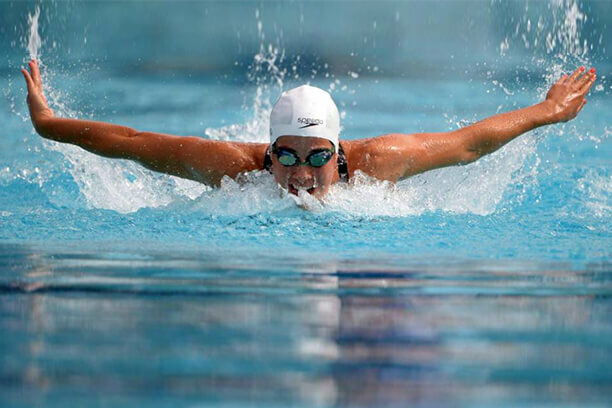 Swimming involves your activity for your different body parts like legs, arms, back, stomach etc. Thus it is a great aerobic workout for your entire body to provide amazing muscle strength. Swimming benefits your body by giving you a cardiovascular workout. So, if you are not the gym type person at all, just be a little pool type and get your daily doses of cardiovascular activity and lower the risks of diseases like heart problems, type 2 diabetes as well as strokes. So all the asthma patients can go for swim sessions and not do the dreadful gym times. Swimming is also found to be good for asthma patients by improving many symptoms like snoring, mouth-breathing etc. In a world of age locking beauty creams, swimming can be one natural way to stay younger. Swimming is found to be helping in increasing body muscle mass, lowering blood pressure, improving blood flow to the brain etc. These can be really helpful in slowing down your ageing process and hence keep you younger looking! Although it is true mostly for oceanic waters, swimming in salt water can be very good for your skin. I know, oceans aren’t that accessible for all of us, but for the ones they are; go have a skin rejuvenating swimming session.